Hampen Sø Camping is well placed for visits to Legoland, the Lion Park and Silkeborg. 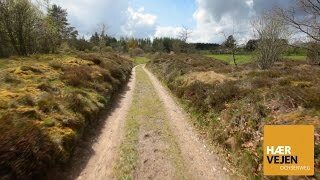 It is in a natural setting close to lakes and moors and there is good cycling and walking in this very pleasant area. There are 230 pitches in total, with 80 seasonal units plus 34 cabins. The pitches are arranged in large grassy bays taking around 15 units, and there are 10A electric hook-ups (long leads may be needed). English is spoken by staff and they will be pleased to help you with tourist information and suggest itineraries. This site is at its best in season, and was not ready at the time of our visit in mid May. The nearby Hampen See is a pleasant walk through the forest and is said to be one of the cleanest swimming lakes in Denmark. There are ‘camperstop’ facilities for two motorhomes to stay overnight outside the main site. This would make an adequate stopover site, but could not recommend it for a longer stay. Three toilet blocks, one basic near the entrance, one central on the site with new laundry, children’s room and a kitchen, and one at the far end with two family shower rooms. En-suite facilities for disabled visitors. Laundry. Supermarket stocks essentials. Bar, restaurant and takeaway (weekends only outside high season; restaurant open to the general public). Games and TV rooms. Very small outdoor pool (15/6-1/9). Trampolines and play equipment. Race track for go-karts. WiFi (charged). Site is on road 176, 500 m. southwest of its junction with road 13 between Vejle and Viborg (50 km. south of Viborg). Look for Naerkoeb supermarket and camping signs.